Tina Sitwell gave a wonderful talk last Thursday 28 May at 7.30pm to 40 Friends of the Swindon Museum and Art Gallery. It was the first, of what I hope will be many talks, by an expert in their field at the National Trust, which of course has its headquarters at Heelis in Swindon. I'll make some excuses in advance, it was hard to take down notes, because I didn't want to miss any of the talk, but here goes. Tina started by putting the National Trust's art collection into perspective, there are 13000 paintings in its care, with some very interesting works in the collection. Under UV light, and after varnish was removed, and the painting was X-rayed, it was clear that there had been alterations made in the painting, such as more hair added on the right hand side of the head, a hand removed from under the cloak and the hat was made less high. This wouldn't have happened if it had been copied, they indicate changes of mind during painting, not copying. Infrared reflectography was also used. 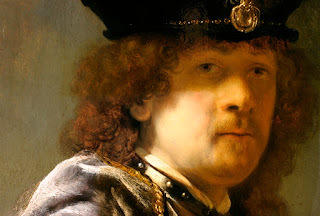 The Rembrandt is a self portrait, showing him dressed up rather finely, the image is sued in other paintings in crowd scenes, lending further credence to the idea it's a true Rembrandt. The pictures below show Rembrandt at a much later date, in 1669. That did bring the speaker to the thorny subject of Rembrandt's signature; this changed over the years, he left the 'd' out of his signature in 1632-3, and then put it back again by 1635. It was however decided that he left out the 'd' in this instance because he'd run out of board in the bottom right hand side of the picture. Tina also talked about the fact it was painted on poplar rather than the more usual oak, none of this matters, it's definitely a Rembrandt.